TV show dates: July 8, 2018 — August 26, 2018. Performers include: Amy Adams, Patricia Clarkson, Chris Messina, Eliza Scanlen, Elizabeth Perkins, Matt Craven, Henry Czerny, Miguel Sandoval, Taylor John Smith, Sophia Lillis, and Madison Davenport. 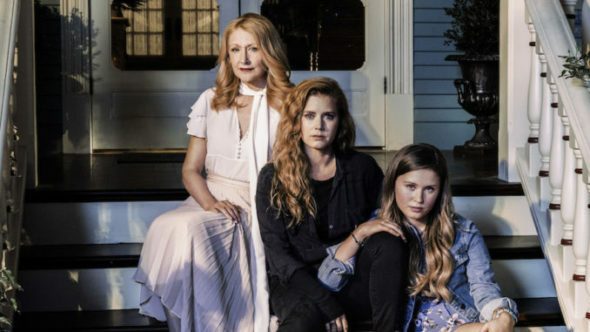 Based on the bestselling novel by Gillian Flynn, the Sharp Objects TV show was created by Marti Noxon and directed by Jean-Marc Vallée from scripts by Noxon and Flynn. In the series, St. Louis newspaper reporter Camille Preaker (Adams) returns to her small hometown of Wind Gap in Missouri to file a story about two missing girls. One is found to have been gruesomely murdered while the other is still missing. Trying to put together a psychological puzzle from her past, Camille finds herself identifying with the young victims a bit too closely. Camille is joined by two officials in following leads. Trying to preserve the quiet reputation of Wind Gap, Vickery (Craven) is a frustrated small-town police chief who’s keeping a lid on the possibility that a local may be a serial killer. Richard Willis (Messina) is a detective who’s been brought in from Kansas City to help solve the mystery. Camille’s mother and the queen of the town’s high society is Adora Crellin (Clarkson). Adora’s serene and picture-perfect life is threatened by the unexpected return of her estranged daughter. Alan (Czerny) is Adora’s attentive and mild-mannered husband. A 15-year-old, Amma (Scanlen) Camille’s half-sister. At home, she’s a restrained and girlish young lady but Amma’s brash and impetuous when she’s with her friends. Wind Gap’s first murder victim is 13-year-old Ann Nash. Hot-tempered Bob (Will Chase) is her father and John (Taylor John Smith) is her brother. John’s temperamental nature raises eyebrows and makes him a prime suspect in the murder investigation. Meredith ( Davenport) is John’s confident and supportive girlfriend. Larger than life, Jackie (Perkins) is a local gossip and renowned alcoholic. Curry (Sandoval) is Camille’s caring and supportive newspaper editor, who has sent her on assignment to Wind Gap. First aired: August 26, 2018. What do you think? Do you like the Sharp Objects TV series? Should this HBO TV show have been renewed for a second season? Big fan of Amy Adams. She was tremendous as was her supporting cast. The story was very suspenseful with surprise ending. Bring Camille back! Actually, I love Amy Adams and Patricia Clarkson as actresses. I also love what I refer to as dark and, at times, depressing films, but this series is so very dark, depressing, over-the-top confusing and down-right inexplicable, that I threw in the towel after six very stereotypical Modern-Southern-Gothic claptrap. This is junk t. v.. If I had my life to live over, I would not change many things–except for wasting about six hours on this mess of a series. Loved the series!!!!!! There’s not many series showing these days where you have to guess what is going to happen which makes things exciting. Hope there will be another series. Best one in a long time. It saddens me that such a trashy series could be received with such “open arms.” I am one who loves dramatic films, even those that my friends would label as “over-the-top depressing.” This series is more than dark and depressing. It is amateurist garbage and one that begs the question, “Is anyone paying close attention to the script?” It is soap-opera drama disguised as Art.